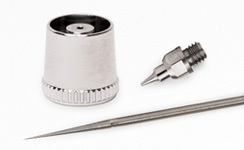 Modify any Tritium airbrush to a 0.2mm, 0.3mm, 0.5mm or 0.7mm nozzle size. Each kit includes all the necessary parts for the conversion and is compatible with both the TG or TS airbrushes. 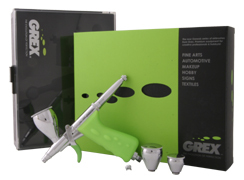 Grex Tritium airbrushes represents our premium line of double action pistol style trigger airbrushes. Their intuitive easy-to-use design appeals to beginners, yet their fine detail control and comfortable operation makes them appeal to professionals as well. 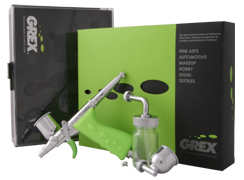 Grex Tritium airbrushes are a comprehensive line that can accommodate to your airbrushing preferences - top or side gravity, left or right hand, big or small reservoir, fine or wide spraying. These are feature packed airbrushes and you'll find the same reliable, high performance quality you've come to expect from any Grex product. Grex Tritium airbrushes come in two forms - Tritium.TG, a top gravity version and Tritium.TS, a side gravity version. Each version is available in three different models with either a 0.2mmm, 0.3mm, 0.5mm or 0.7mm nozzle size. Other than feed type, features of the Tritium.TG and Tritium.TS are the same. Which one to choose is really a matter of preference. See the advantages of each versions' feed type by clicking here. 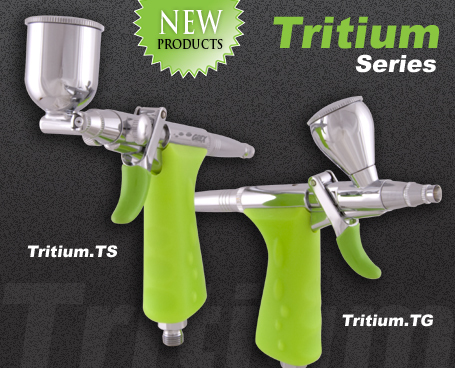 The nozzle size on any of the Tritium airbrushes can be changed with optional conversion kits. See side panel for the different model numbers, contents of the airbrush sets and information on the Nozzle Conversion Kits. An intuitive, easy-to-use, and comfortable trigger system that offers fine control from detailed to wide spraying. Two stage operation; first half of trigger motion controls the air and the second half controls the paint volume. Pistol style handgrip with a textured surface offers a firm and comfortable grip. It helps minimize hand fatigue and cramping and allows individuals with chronic finger or hand problems to airbrush. Fine thread screw-in design for precise nozzle centering. Stainless steel construction with large diameter threads for extra durability. Precision machined for optimal paint flow through nozzle and optimal air flow around nozzle. Long taper at needle tip provides superior fine paint volume control. Precision machined from stainless steel for a durable matched fit to the nozzle. Allows for precise paint volume control and adjustments. Dial in the Pre-set Knob to limit the paint volume for an easy way to create consistent spray patterns. Or dial it all the way back for full trigger control. Patented design that makes it easy to take off and easy to put on yet still securely stays on when you need it to protect the airbrush needle tip. Available as a standard and crown type cap. The crown version of our Quick-Fit™ needle cap. Cut-away sides allows improved air flow when spraying close to the work surface so that fine detailed patterns can be achieved. Convenient storage and quick access for either of your Quick-Fit™ Needle Caps when you're not using them. Easy to take off and easy to put on, but they're held on securely until you need them. Optional nozzle conversion kits allow you to modify any Tritium airbrush to a 0.2mm, 0.3mm, 0.5mm or 0.7mm nozzle size. See side panel for details. provides fine atomization for a smooth finish. are replaceable and accepts most paint media. provides durability and ease of cleaning. from reservoir to nozzle tip for a responsive feel. Top mount reservoirs are detachable so you can choose the perfect reservoir type and size for your project. Set includes a 2mL (1/20 fl. oz.) top cup w/ lid, a 7mL (1/4 fl. oz.) top cup w/ lid and a 15mL (1/2 fl. oz.) top cup w/ lid. A small built-in paint reservoir - easy to clean and perfect for minute amounts of paint. The shape of the top gravity cups are designed for optimal paint flow even when the airbrush is held at large angles. It's a stremlined design so no paint gets collected in the cup. In-line top gravity cups directly above the airbrush offers balanced handling. Side mount reservoirs are detachable so you can choose the perfect reservoir type and size for your project. Set includes a 7mL (1/4 fl. oz.) side cup w/ lid, a 15mL (1/2 fl. oz.) side cup w/ lid and a side siphon attachment w/ 30mL bottle. Side reservoirs are screwed on to the airbrush and then secured in position with a lock nut. This allows the reservoir to be adjusted to any angle so that paint flows correctly regardless of the angle and position you're working in. Side reservoirs can be mounted on either side of the airbrush to accomodate both left and right hand users. Side reservoirs provide a clear view of your work when you're holding your airbrush perpendicular to your body.